Arrived at the office this morning to find the power was out. No lights, no computer, and most importantly no coffee. I immediately locked the office back up and went in search of the black stuff. Mortens cafe is just yards from the office. 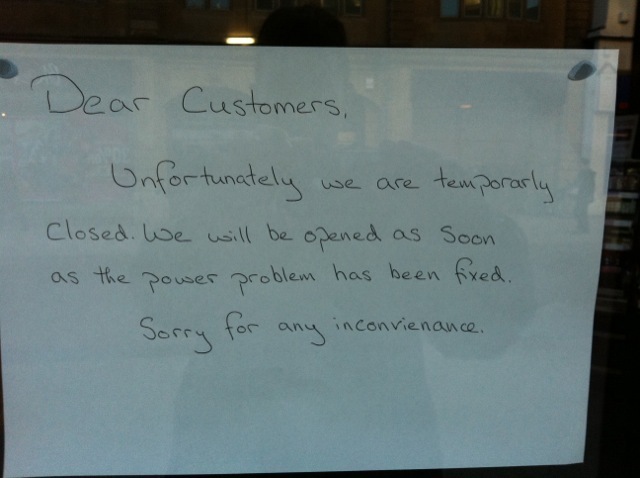 Unfortunately that meant it was hit by the same power cut. Greens Cafe the same. Costa same. Pret A Manger too. Thankfully, even the indomitable McDonalds was shut, otherwise who knows what could have happened. Now back at my desk with the power back and half way through cup #2, I'm beginning to suspect I may have a slight dependency.